Kye and Nicole tragically lost their much loved son Zane on the 8th February 2014. 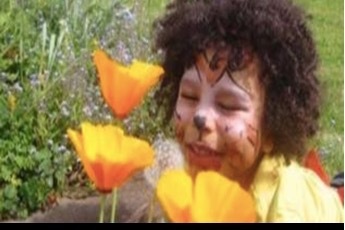 Zane was a lively and happy little boy who brightened the lives of all who met him. Officials are investigating whether Zane’s death was caused by carbon monoxide poisoning. But family, friends and the fire services crew have highlighted that there is evidence to suggest the real cause was hydrogen cyanide, a toxic gas that can lurk in unregulated landfill, released from the ground by mixing with floodwater. The fire and rescue team who attended the incident and monitored the air in the family home confirmed very high levels (25,000 parts per million) of hydrogen cyanide were present. Hydrogen cyanide was also found in the family's blood. It is understood that hydrogen cyanide can be released into the breathable atmosphere from flood water following a change in pressure or temperature. If this was the cause of Zane’s death, then clearly there are issues of public safety that require urgent attention. After Zane and his family were taken to St.Peter’s hospital in Chertsey, the police and fire services evacuated nearby homes and a public health warning was issued for those in the area feeling unwell to seek urgent medical assistance. Seventeen other local residents and police officers were ambulanced to hospital, isolated in contamination areas and then tested and and observed. 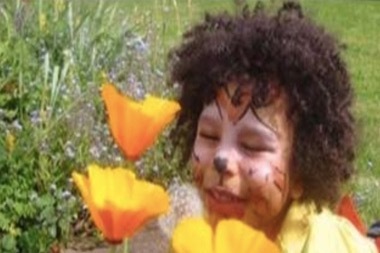 Despite the reports high levels of hydrogen cyanide were found at the property, reports in the press suggested Zane’s death may have been caused by carbon monoxide poisoning from pumps in the family home. The family have said that the only pumps which were on at the time were electric. The house is a rare all electric house with no gas supply and no capability of generating carbon monoxide. No carbon monoxide was recorded in the family home despite several sweeps of the house. Also, it took Public Health England 14 weeks to confirm to the family that hydrogen cyanide was indeed found in their flooded house and amazingly, despite the immediate finding of hydrogen cyanide in the home, the pathologist was never told to test Zane’s blood for hydrogen cyanide. However, as early as March, the family sent a report to the coroner suggesting excellent lines of enquiry including testing for hydrogen cyanide. They are still to confirm what actually killed Zane. The family’s own investigations into the surrounding area have since revealed that a field 6 metres from their home that contains a lake and looks so idyllic, is actually contaminated land but this did not show in environmental searches. Zane’s parents bought the house in 2004, when an environmental report showed no land contamination. However, subsequent reports for a neighbouring property in 2011, and for their own home, ordered by Zane’s parents last month, indicate contamination due to an old landfill site behind their home, now an infilled lake. 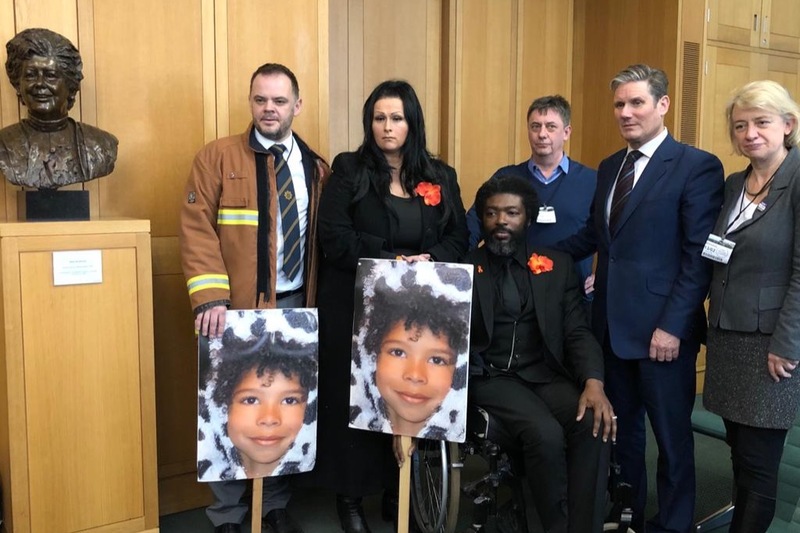 Both Mr Gbangbola, who still has to use a wheelchair following his illness, and Ms Lawler believe there is a chance that families in other homes may be at risk since restrictions on what could be dumped at landfill sites in the past were less stringent. Also, no notice was given to the home or business owners in the area that would have been affected by the reclassification to contaminated land. In short, it appears that the very agencies here to protect us believe the truth will do more harm than good. Their focus is on the avoidance of national hysteria over the possible risk posed by old contaminated, undisclosed landfill sites throughout the UK. How many are there? Could you be living by one? 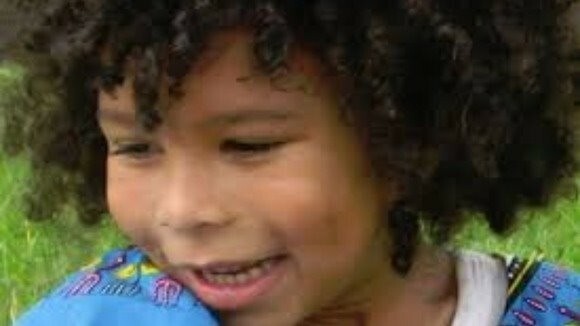 Zane’s parents are deeply concerned that all possible causes of his death are not being investigated fully. Nicole and Kye are bereaved parents who deserve to know what really happened to their son. Also, they are currently homeless, unable to return to their home and Kye is still in a wheelchair. They have been left ‘broken’ by the death of their son and frustrated by the lack of answers. Mr Gbangbola said: “We really want to push and find answers because it is wrong that these risks can occur. Ideally this is something we would like to be able to highlight nationally. This deadly gas has come from somewhere, the authorities need to admit its presence, investigate its source and act to prevent more deaths and illness.” He said “We miss Zane every second of the day and all those who spent time with Zane commented that Zane was a truly remarkable boy. We would not want anyone else to experience this pain and burden of a living hell”.
. To provide support, including financial assistance, to Zane's family.
. If the above objects are fulfilled then the objects of the Fund shall be to pursue such purposes in similar cases arising in the United Kingdom. If you would prefer to donate by cheque, please email for details. Whilst this site requires an amount to raise to be entered, we do not have a total in mind. All donations are being raised and controlled by Zane's parents direclty, generously received and a blessing to Kye & Nicole. Thank you. The first 2000 people to buy the book will receive a Limited Edition Hard back book with their name in it. The cost is £20 for this book which will be produced once we hit the 2000 person target. The proceeds will fund production of the Limited Edition and facilitate national and international mass production thereafter as buyers require. Nicole and I would like to thank you for buying the limited edition book in advance and supporting our quest of Truth and Justice for Zane. 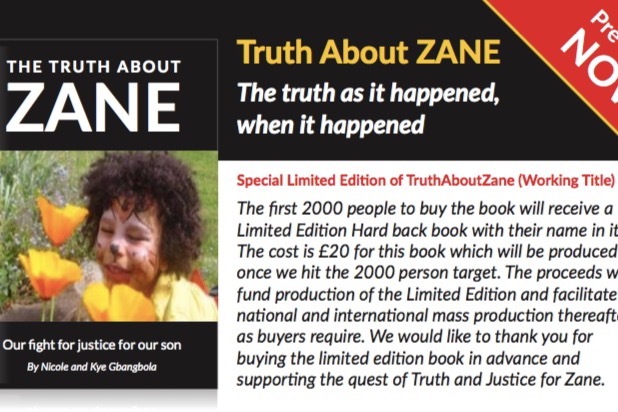 ZANE’s BOOK ON SALE NOW - Zane the Truth - Please pre-order your copy now! Thank you for those who have already purchased a copy. I can't understand this, if you remember this was an incident that required a shut down to the whole area, residents were evacuated and prevented from going home. Several residents had to be tested because cyanide was detected and made the news as A MAJOR INCIDENT. How come all the evidence related to this has now disappeared. Someone needs to explain what happened to the cyanide readings taken on the day. Obviously the truth is yet to come out. Those people who are concealing the truth, should reflect on what happened to those who lied about the Hillsbourgh disaster. When the families of those who died know there lies being told they will Never give up. The truth comes out in the end, and those people are now paying the price. The truth will out. Please donate to this worthy cause and for the sake of everyone who lives near an old landfill site. It is disgraceful that the parents are having to raise money for legal aid they should get by right. This is good news. The truth will out - it always does in the end. It's just so awful that it is taking so long, with so many cover-ups. Those responsible for the death of Zane must be held accountable. How do they sleep at night? Your comment on the Russian and nerve agent is very pertinent with Rudd’s verbal when the officials have oppressively pushed justice to the side in the case of Zane who died of similar category. What is the latest news with the legal fight for justice - can anyone tell me? Really good news you are so near the target and have secured representation, although how depressing that you were forced down this route instead of being granted funding automatically. this does not surprise me one iota, classic behaviour by Spelthorne Council, who have some deeply unpleasant people in charge . Good to hear you have such a valuable ally. Keep the fight going, a lot of decent people are supporting you and are hoping that you succeed.